SUPERB QUALITY SILVER-GILT AND ENAMELLED BADGE WITH BIRMINGHAM HALLMARKS FOR GARRARD & CO. In 1973 HM Queen Elizabeth II extended the insignia by granting that a neck badge, of smaller size than the breast badge, might be worn. This can be worn in addition (except with morning coat) to the breast badge and also has the great advantage that when a Knight Bachelor is wearing uniform, he has a ribbon and badge to show his status. A miniature badge may also be worn on suitable occasions. The neck badge is now presented by the Sovereign to the Knight Bachelor at the time of his investiture. 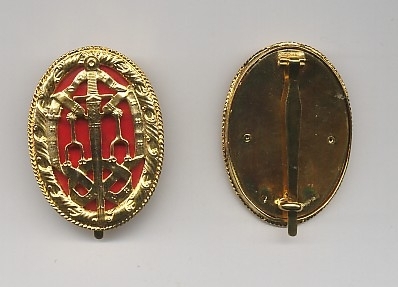 The breast badge and miniature are purchased later if required. By Royal Warrant of December 1998 Knights Bachelor may now wear both their neck badge and breast badge at the same time rather than as alternatives, in appropriate dress. This brings Knights Bachelor into line with knights of the Statutory Orders.